VeriFone credit card terminals are a true workhorse for transaction processing and receipt printing at the POS checkout area. 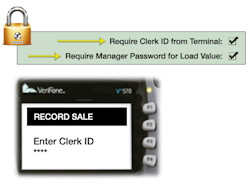 Depending on the exact model, the VeriFone Vx and Evo class of terminals can process over a land-line high speed Ethernet connection, wireless and/or a dial-up telephone line. Certified VeriFone credit card terminals are capable of running either stand-alone Gift and Loyalty or can be programmed to run both credit card processing and Gift and Loyalty simultaneously on one terminal. The user interface on a VeriFone terminal is simple and staff training takes less than 5 minutes. The main menu features standard Sale, Balance Inquiry, Load Value, Void and Report menu functions. Sales and redemptions are performed in one (1) consolidated transaction for efficiency. For merchants selling memberships, we can easily enable a Buy Membership transaction type with the name(s) and price(s) of your memberships available for sale at checkout. When using the same terminal for credit card processing, the clerk selects the STAR (*) key to toggle back and forth between applications. 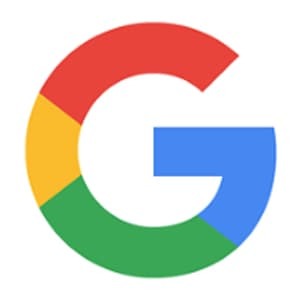 Optional security controls are available to require the input of Clerk IDs to track each employee back to a specific gift and loyalty transaction and/or ensure only authorized personnel can use the more sensitive Load Value functions (Load Gift, Load Reward, Load Widgets). Both the Reconciliation and Fraud Monitor Report display clerk IDs by transaction and additional fraud preferences can be configured to examine the activity of specific patrons and/or clerks for closer management review. 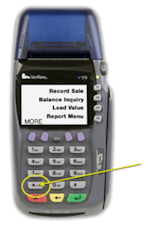 The Vx680 is VeriFone's flagship wireless terminal for merchants on the move or who don't have the landline capability from POS checkout area but prefer the convenience of credit card terminal transaction processing over alternate deployment options. The Vx680 delivers wireless connection through GPRS or Wi-Fi/Bluetooth combo or 3G to meet any environment requirement. It also empowers mobile payments with VeriFone's NFC software technology, enabling the full flexibility to manage multiple NFC mobile wallets. The only downside... it's an expensive terminal priced 3-4x the cost of land-line only dual com terminals. 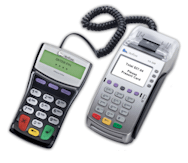 Loyal Patron is compatible with the VeriFone Vx520 terminal, which is EMV compliant. However, EMV regulations require your credit card processor to "sign" (approve) 3rd party download. 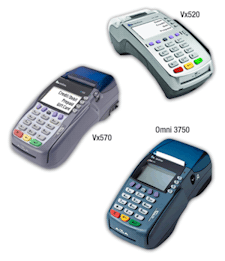 Our VeriFone Vx520 signing partners include the following list of credit card processors. If your processor is listed below we can download Loyal Patron as a separate app on the same Vx520 terminal running your credit card application. If your processor is not on our signing list, please ask your sales rep or Tech Support department whether they support 3rd party application signing on the VeriFone Vx520 and if so, send an email to support@loyalpatron.com and your merchant services rep so we can work behind the scenes to enable a signed download file. If your CC processor is not amenable to signing our app, we'll set you up with a stand-alone VeriFone terminal that runs gift and loyalty exclusively that can be positioned next to your credit card terminal.1000s of merchants use dedicated machines for special apps such as gift and loyalty processing. Plus you retain the option to switch processors to one that enables download and willing to match or beat your current fees. Call us at (800) 978-1338 to discuss Loyal Patron integration options.